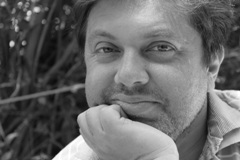 The Ukrainian author, cultural studies scholar, and journalist Jevgeni Demenok was born in Odessa in 1969. He studied at the Kyiv Mohyla Business School in Kiev, where he received an MBA. He subsequently opened a chain of children’s cafés and centers for non-formal education in Odessa. As well as being a journalist and cultural expert, Jevgeni Demenok is also an art collector. He has written numerous articles and essays about artists associated with Odessa, such as Leonid Pasternak, Franz Roubaud, Wassily Kandinsky, Mikhail Larionov, Natalia Goncharova, and many others. Based on extensive research in archives in Prague, he also wrote a book on the »father of Russian Futurism«, David Burliuk, and his siblings, who are also considered part of the Russian avant-garde. »Nowoje o Burljukach« (2013; tr. News about Burliuk) examines, in particular, the artist’s little-known early period, and contains previously unpublished photographs and poems by Burliuk. Demenok writes for various newspapers and magazines in Ukraine, Russia, Israel, United States, the Czech Republic, Canada, Cyprus and Greece. He is a co-founder of the literary studio »Seljonaja lampa« (Green Lamp) and the philosophy club »Filosowski parochod« (Philosophers’ Ships) at the Worldwide Club of Odessites. For his book »Nowoje o Burljukach« he was awarded the municipal Paustovsky Prize. Jevgeni Demenok lives in Odessa.